A bald eagle and a red fox tussle over a European rabbit in San Juan Island National Historical Park in Washington state. 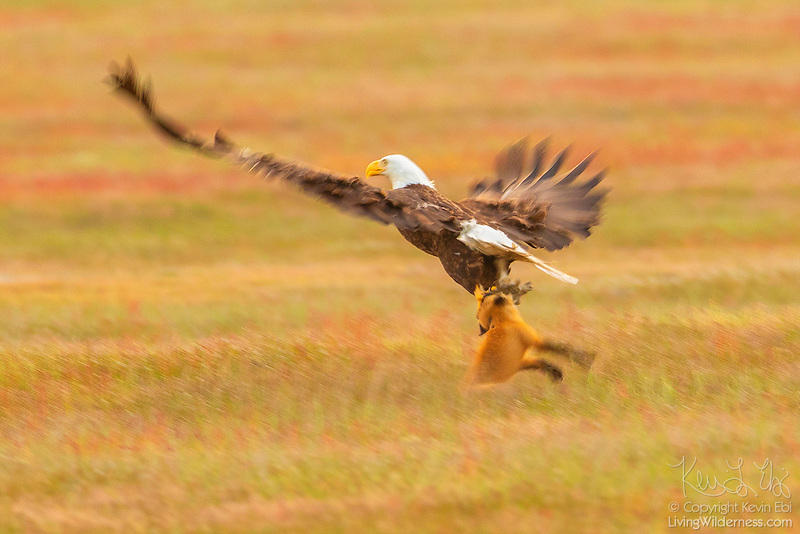 The fight began when the bald eagle attempted to steal the rabbit away from the young fox, known as a kit. When the bald eagle grabbed the rabbit, it inadvertently also caught the fox, lifting both more than 20 feet into the air. The fox swung back and forth trying to take the rabbit back. The bald eagle released the fox and flew off with the rabbit. The whole struggle lasted 8 seconds. Both European rabbits (Oryctolagus cunuculus) and red foxes (Vulpes vulpes) were introduced to San Juan Island. The rabbits were introduced to the island in the 1890s by settlers; foxes were introduced occasionally in the 1900s. The European rabbits in particular are considered an invasive species, turning the prairie into an unsustainable barren landscape with their vast burrows. This displaces small native mammals, such as the Townsend's vole. While bald eagles and foxes occasionally hunt rabbits, it is a relatively rare occurrence. Up to 97 percent of an eagle's diet consists of fish and birds; red foxes more commonly eat berries, insects and small mammals, like the vole. Copyright 2018 Kevin Ebi/LivingWilderness.com. All rights reserved.